Gavin bred BORDER 14/3821 from LINCOIN’S brother GPU 13/18534 and ZA 13/63223 (daughter of Bertus’s BLIKSEM 73 and 43339). BLIKSEM 73 is the nestmate brother of SUPER BLIKSEM. 43339 won five races as a yearling and is a daughter of one of Bertus’s foundation pairs GOLDEN EYE x LICHTE KLEINEN. 8th club, Combine and BHU Richmond 411km 1160mpm. 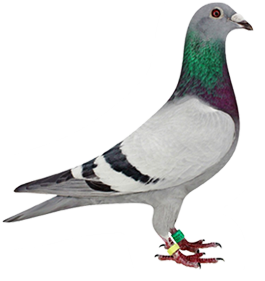 He was also transferred to the breeding loft and bred BORDER 16/1382, one of the best pigeons Gavin ever owned. More about her in PART 4. BORDER 16/1383 – 2nd club and Combine Richmond 411km, 3rd club Richmond 411km, 3rd club Vryheid 738km 1139mpm, 5th club Kokstad 303km, 11th club Ixopo 375km. BORDER 17/3221 – 1st club Kokstad 303km 1344mpm and 3rd club Ixopo 1124mpm. 1st club Ixopo 375km 1138mpm. He got badly injured later in the season and Gavin had to put him down.